The idea of the High Reliability Organisation (HRO) was developed by Rochlin, Roberts, Consolini and, LaPorte (1987, 1991). Their research was inspired in part by naval operations, they wondered why some organisations were failure resistant and why other organisations failed. Organising is described by Weick (1979, p. 3) as: ‘consensually validated grammar for reducing equivocality by means of sensible interlocking behaviours’. This quote is the critical foundation for the unit. These are the focus of the unit and the assessment. All of these concepts about organising are critical for understanding HROs. 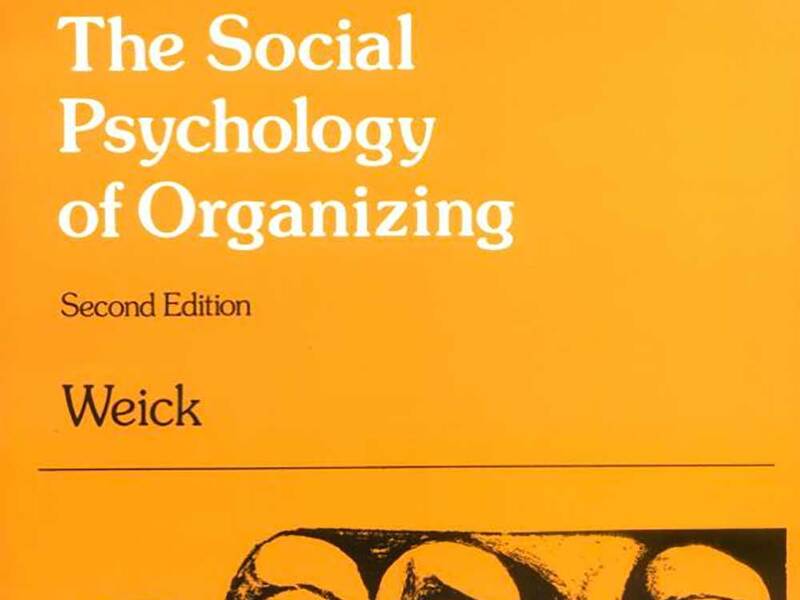 Weick, K., (1979) Social Psychology of Organizing. McGraw Hill, New York. How do I know what I believe until I see what I do? How can I know what I think, until I see what I say? Is there a cookbook? Why do you want a cookbook? What does it mean to be collectively mindful? and to Sensemake? What does it mean to be fully human? Why do some want to be superhuman? How much can we control? Why do we want to control? What is the paradox of organising? How does leading and following manifest in a HRO? What is meeting? Why respectful interactions? Why is enactment so central for a HRO? How can the HRO framework and principles be applied to organisations and Risk? Are heuristics logical or ecological? What of Occam’s Razor? How does a HRO discern risk? What of bounded rationality and optimisation? What of automaticity and satisfying? How can Weick’s constructs be used to assess organisational well being and health? Case Study of an organisational activity, project or task using Weick’s Organisational Sensemaking and Collective Mindfulness constructs. The assignment is comprised of a report (2500 words) on an activity or small project in an organization with which you are familiar. In this report you will use Weick’s constructs to analyse the nature and character of the activity. This is not a comparative report nor does the activity have to be successful. The purpose is to show that you can use Weick’s constructs to evaluate organising. The table at the close of this unit outline provides a useful tool to get started. Long, R., (2012) Risk Makes Sense, Human Judgement and Risk. Scotoma Press, Canberra. Amalberti, R., (2013) Navigating Safety, Necessary Compromises and Trade Offs – Theory and Practice. Springer, New York. Argyris, C., and Schon, D., (1996) Organisational Learning II, Theory, Method and Practice. Addison Wesley, London. Aronson, E., (2008) The Social Animal. Worth Publishers, New York. Gigerenzer, G., (2000) Adaptive Thinking, rationality in the Real World. Oxford University Press, London. Gigerenzer, G., (2001) Bounded Rationality, The Adaptive Toolbox. MIT Press, London. Gigerenzer, G., (2014) Risk Savvy, How to Make Good Decisions. Viking. New York. LaPorte, T. R., & Consolini, P. M. (1991). Working in Practice but not in Theory: Theoretical Challenges of High-Reliability Organizations. Journal of public administration research and theory, 1, 19–47. Mitroff, I., (2001) Managing Crises Before They Happen. Amacom, New York. Mitroff, I., (2004) Crisis Leadership: Planning for the Unthinkable. Wiley, New York. Mitroff, I., (2005) Why Some Companies Emerge Stronger and Better from a Crisis. Amacom, New York. Noth, W., (1995) Handbook of Semiotics. Indiana University Press, Indianapolis. Rochlin, G. I., LaPorte, T. R., & Roberts, K. H. (1987) The self-designing high- reliability organization: aircraft carrier flight operations at sea. Naval War College Review Autumn 1987. Rochlin, G. I. (1993). Defining high-reliability organizations in practice: A taxonomic prolegomenon. In K. H. Roberts (Ed. ), New challenges to understanding organizations (pp. 11 – 32 ). Macmillan, New York. Rochlin , G. I. ( 1999 ) Safe operation as a social construct. Ergonomics, 42,1549–1560. Weick , K. E. ( 1988 ) . Enacted sensemaking in crisis situations . Journal of management studies, 25(4), 305–317. Weick, K. E. (1993). The collapse of sensemaking in organizations: The Mann Gulch disaster. Administrative science quarterly, 38(4), 628–652. Weick, K. E., Sutcliffe, K. M., & Obstfeld, D. (1999). Organizing for high reliability: Processes of collective mindfulness. Research in organizational behavior, 21, 13–81.